When a loved one dies, it can feel like the end of the world as we know it. The natural response of grieving for our loss is a hard and extremely painful process to go through, and we all have a different and unique response to losing someone close. Bereavement counselling is there for you when it seems like you’re drowning in sorrow, unable to move forward. That’s when it can be enormously beneficial to work with a trained therapist who can help you through the stages of grieving to enable you to acknowledge and process what has happened. With the benefit of counselling, you will in time allow life to continue with adaptation and change while preserving the memory of the person who passed away. 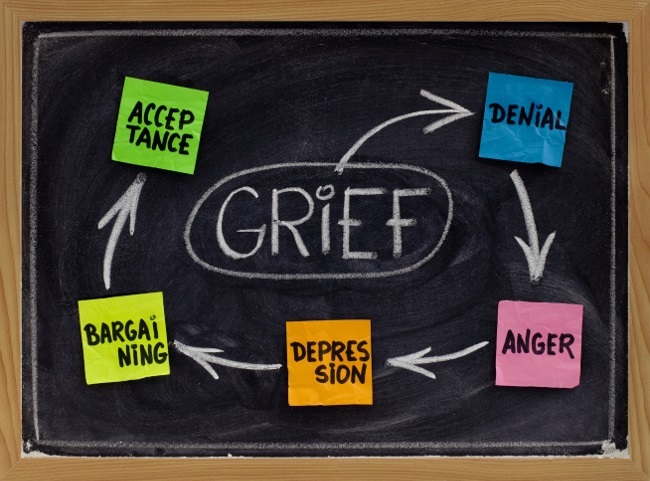 There are 5 generally recognised stages of grieving that we all go through when learning to cope with personal loss. As you move through the bereavement process, you may experience some or all of these stages and in any order. It is an important part of the healing process to allow yourself to experience and accept all the feelings as they occur. The first response to a bereavement is typically one of disbelief and shock, even if the death did not come as a surprise. Numbness is often a natural reaction to an immediate loss – it’s our body’s way to shield us from the intensity of the event, and can be useful when action needs to be taken, for instance to make funeral arrangements. As we slowly acknowledge what has happened, the feelings of shock and denial will diminish. This stage involves an intense preoccupation with what might have been, if only some other course of events had occurred. It’s easy to obsess endlessly about how things could have been better, what could have been done to prevent the worst outcome. That’s why it is important to resolve this stage, so that guilt and remorse don’t get in the way of the long-term healing process. Many people will experience anger over their personal loss which may feel unfair and untimely. Strong feelings of anger can be a result of perceived helplessness and powerlessness, either as a result of having somehow been ‘abandoned’ by the deceased or because a higher power was at play. Once the full extent of the loss is realised, sadness and loneliness begin to set in. Normal responses may develop into depression as it becomes difficult to ease the pain. Sleeplessness, low mood, appetite disturbances, lack of energy, self-pity, social withdrawal and physical pains are all symptomatic of this stage of grieving. In the final stages of bereavement, we begin to fully accept that the death has occurred and we are slowly allowing ourselves the ability to manage its effect on us. Healing can begin once the loss becomes integrated into our life experiences and we are able to move forward with our life. If you feel that it would be helpful to speak to an experienced bereavement counselor to share your personal circumstances, please contact us to arrange an appointment at one of our London clinics.